It is time for Bridget to leave after many long hard days out in the desert. But this last day is the day for celebration and many people from the Paranal Observatory gather to watch Bridget’s last traverse before she needs to go back in the shipping crate. 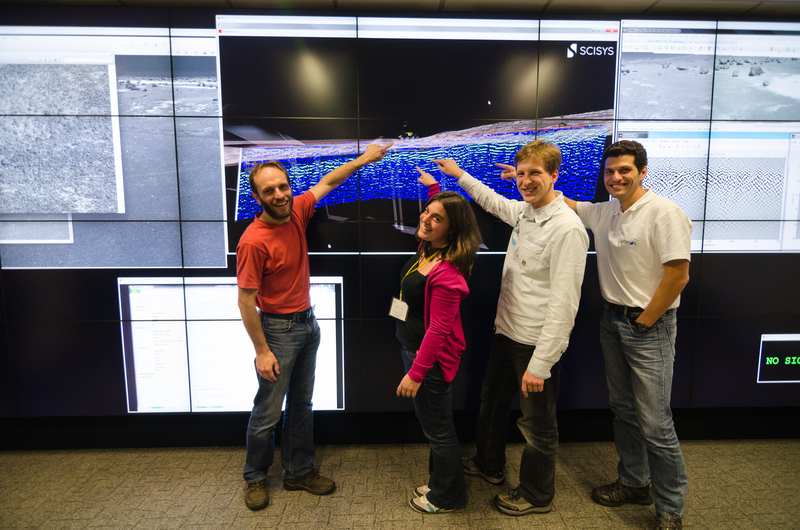 Paranal staff gathers to see the rover. Even the chef is there! It’s been an intense but exciting few days at the RCC with operations running from early morning to late at night. The team are based in the CATAPULT centre and are making full use of the large video wall to display data from the sensors and 3D planning tools. 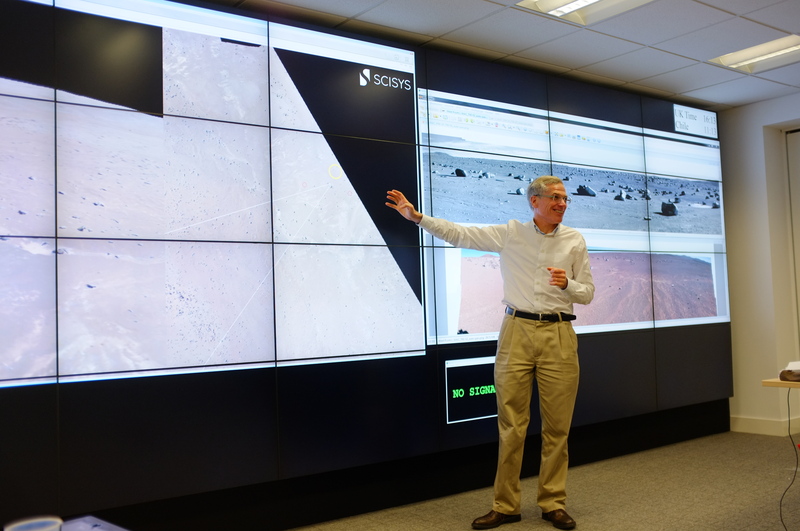 Each day begins with a review of the previous sol’s uplinked data in order to allow the team to select new targets or trajectories for further investigation. 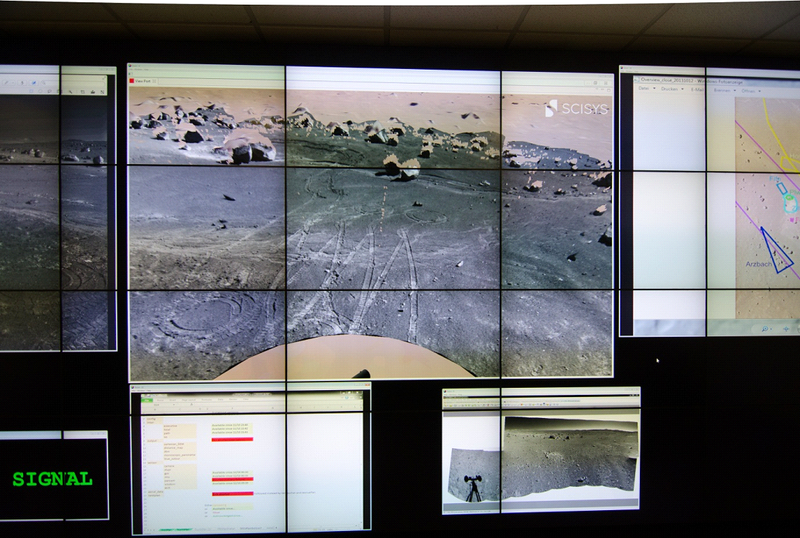 For the early phases we were joined by senior observers from missions such as ExoMars. The team must quickly check Bridget’s current position given that it must be removed from the site overnight. They then consider good observation points for instruments and safe paths for navigation. A key goal for SAFER was the desire to use information from the various sensors in an integrated way. This allows individual instruments teams to see where their data originated from and allows scientists to understand the terrain in context. 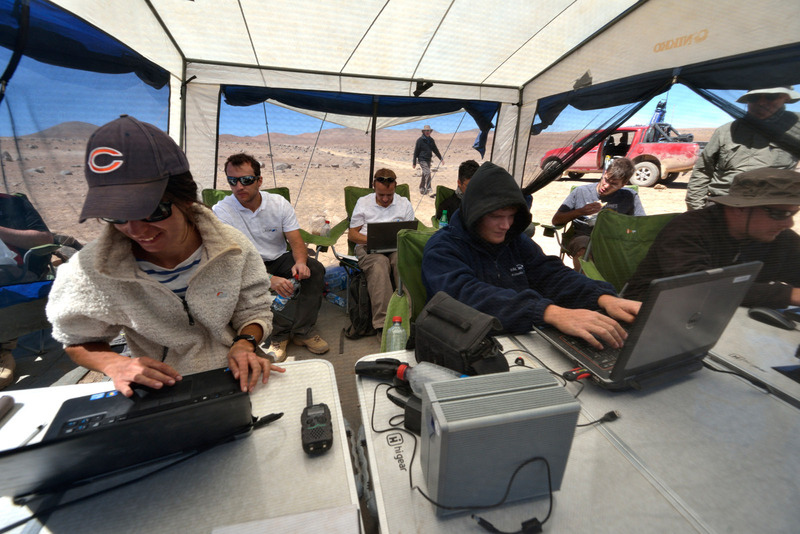 Once a plan has been prepared it is dispatched to the LCC team who then forward it onto the rover. Plans can take anywhere from 15 mins to several hours to execute. Whilst awaiting the data to be uplinked from the Rover, the team start to prepare for the next plan and explore what if scenarios in case of any issues. As we enter our last day it’s clear that this has been a fantastic learning experience for all involved. As our lead scientist Susanne noted we had our own “flight moment” on Thursday when the WISDOM team got to see their data displayed in 3D for the first time on Thursday evening. Looking forward to the next field trial! RCC Over and out. Leander (aged 12) dispatches our final plan! Joanneum Research DEM integrated into the 3D environment. Jorge Vago from ESA discussing site exploration strategies. We had a surprise visitor during breakfast today. Even this dry desert is full of life. Long range wireless pointing to Paranal. We have named the rocks next to the antenna. A dry and cold morning with limited shelter, but luxury of internet. However we have learned from our dust devil experience. LCC now using Rauls windproof tent and more cars as windbreaks is ready for the strong winds. The new LCC layout uses more cars for wind protection, Rauls wind resistant tent and more ropes. We have also moved the wireless antenna to a high beam on a truck to keep it in good visibility of the rover. The trusty generator is doing its work and with the long range wireless we got 2 Mbps down and 3 Mbps uplink to the UK today!